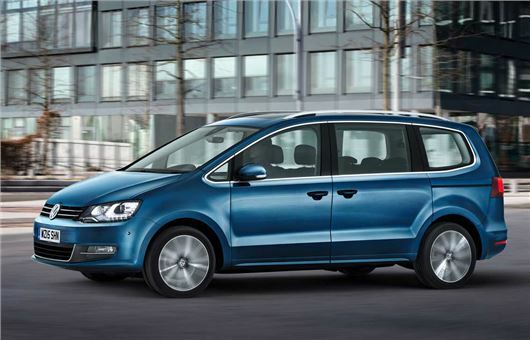 The revised Volkswagen Sharan is now available to order with the first cars due in October. Prices start at £26,300 which gets you the 1.4 TSI engine in S trim while the cheapest diesel is £26,970. The changes to the exterior of the seven-seater are minimal but it does get more economical engines and a second generation touchscreen infotainment system on all models. Standard equipment also includes Bluetooth, an automatic post-collision braking system plus three-zone climate Climatronic air conditioning. SE models get chrome roof rails, parking sensors front and back plis cruise control and tinted rear glass while the top SEL has adaptive cruise control, a panoramic sunroof and Discover Navigation. There's one petrol engine choice - a 1.4 TSI with 150PS while the rest of the range is powered by the same 2.0 TDI engine with various power outputs of 115PS, 150PS and a top 184PS version. All engines, with the exception of the 2.0 TSI 115PS, are available with an optional six-speed DSG automatic alongside the six-speed manual.